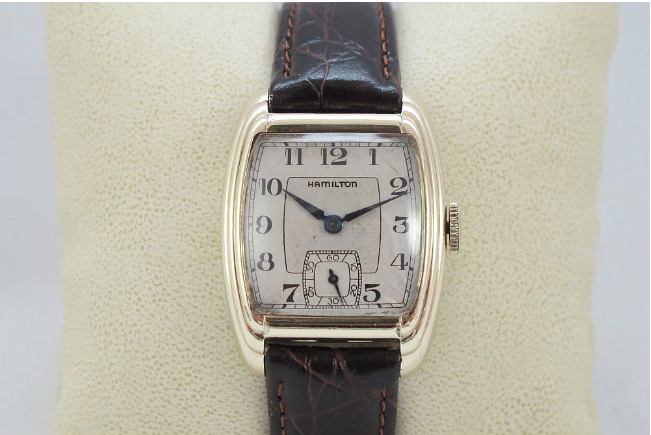 The 1937 Hamilton Sidney echos many design details of the 1930's. Produced through 1940, the Sidney features a stepped case that to me looks like folded angels wings. Two dial choices were available, the AGN dial shown in the ad above or a black enamel dial. Like most models, the enamel dial is very striking and the Sidney dial is actually a two-tone white / butler finished pattern. The 10K gold filled case came only in yellow. It's very prone to wear through to the top of the bezel near the corners of the crystal. The edges of the case back can also exhibit wear. The Sidney is a sharp looking watch, especially in a wear-free case. The "Sidney's" stepped case is reminiscent of the 1953 "Lyndon" cld watch, with its' stepped lugs. I have a "Sidney" both in the AGN and in the two toned enamel dial. It has a, to use an old term, fetching look on the wrist. When I wear one or the other, people ask me about the watch. Another great post. Do you know if the movement for the Sidney was the 987A originally? Thanks. 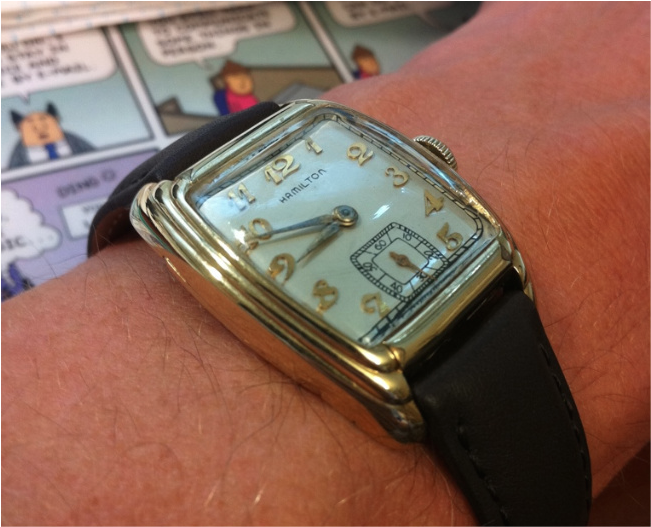 Being a 1937 watch, it likely has a 987A, since that movement was introduced the same year. However, it's possible it had a 987E if it was an early Sidney that used remaining 6/0 sized 987E's from inventory. It would not have had a 987F or 987 originally though. Thank you. It helps to know that most Sidneys use the 987A. In your experience, have you noticed any specific issues with the 987A or any other 987 movements? I read a couple of accounts stating the balance staff is a possible weakness. (I am a complete novice.) Thanks again. The balance staff is a delicate part of any watch. The balance assembly moves the most of any part in a watch and it needs to be near friction-less. As such, the ends of the staff have been whittled down to act like tiny axles called "pivots". In all watches, the pivots are prone to breaking or bending if the watch is dropped onto a hard surface. In the 1950's, little shock absorbing springs were added to the balance jewels that support the balance staff - and the springs protect the delicate balance staff from sudden jolts. But prior to 1950, no Hamiltons had shock-protected jewels and replacing balance staffs was a large part of a watchmaker's repertoire. That said, the 987A is a great movement - it was on the arm of thousands of WWII soldiers, Marines and sailors. It's predecessors, the 987, 987F and 987E are a little more finicky but they share a lot of the same parts (like the balance staff) with the 987A. Hamilton didn't make poor movements. They're more delicate than today's shock jeweled movements but they were the best America had to offer for many decades. Thank you for this. Very informative and helpful. So could we safely say that the Sidney (with 987A movement) is 100% made in the USA? I've been considering either a Sidney or another Hamilton, which uses the 661 movement (from the 1950's). I believe the latter was Swiss made. Yes - All Hamiltons made pre-1953 were entirely made in the USA. Automatics were introduced in 1954 and provided by Swiss ébauche makers. An ébauche is a partially completed movement... say 95% complete and another company would finish the remaining 5% and put their label on it. The 661 is a Buren movement, made in Switzerland. Buren was eventually purchased by Hamilton and when Hamilton stopped manufacturing in Lancaster, they moved manufacturing to Buren's Swiss facility. ETA made many of the 1950's and 1960's Swiss movements (manual and automatic) and they still make Hamilton's movements today. A lot of collectors "turn up their noses" at Hamiltons with Swiss movements and think they are inferior. They are miss-informed. Instead, models with Swiss movements were merely models offered at a more competitive price point in an ever-increasingly competitive watch market. 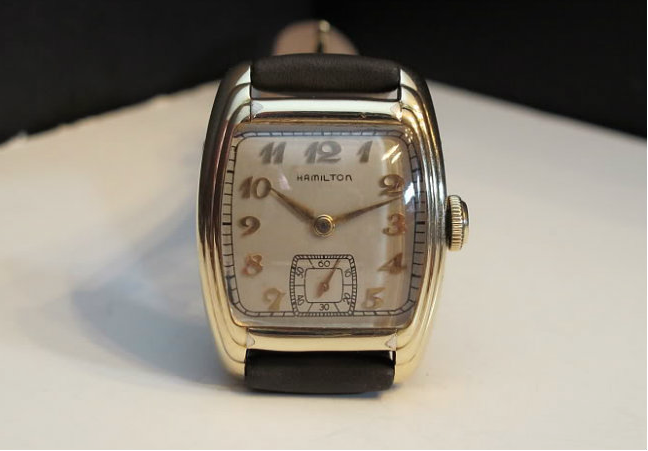 Many of Hamilton's uber-desirable models have Swiss-made movements. So we could call the 987A a truly "in-house" movement. And the 661 an "ébauche" movement, correct? I have to admit: owning an in-house movement from Hamilton, completely made in the USA, which later provides service to the US military (and as I believe I've read, to the British military) has a certain historical appeal. And don't get me wrong: I love Swiss-made.